This "Historically Speaking" column appeared in the Exeter News-Letter on Friday, April 14, 2017. 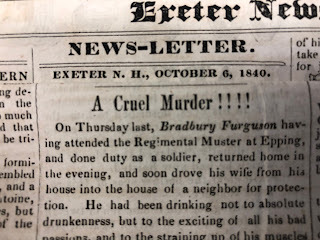 “The Civil War began and ended in April, a month otherwise marked by momentous events,” wrote Exeter News-Letter editor John Templeton. “That of this year will be memorable. Congress re-assembles next week, and war with Germany, long averted in the face of repeated provocation, is likely to be declared.” When he published these words on March 30th, 1917, Templeton was fairly certain where events would lead. President Wilson had already severed diplomatic ties with Germany months earlier. Three days later, the man who ran for reelection with the slogan, “He kept us out of war” would ask Congress for a declaration of war. Templeton urged caution. 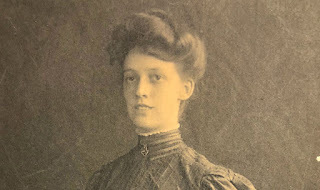 “We should not, however, go into a delirium of patriotism, which may easily be misdirected, and there are fads and movements which should be checked in incipiency.” On Sunday, April 5th, 21 year-old Betty Tufts scrawled across the top of her diary page, “WAR! Horrible!” Exeter, and the United States, had entered the long avoided World War. For people at home, there were numerous concerns. “The Committee on Food Production has secured several tracts of land in different part of the town for the free use of citizens who have not sufficient land at their disposal for raising at least a family supply of vegetables,” noted the News-Letter. During the ensuing months, people would be encouraged to conserve foodstuffs, but rationing was never introduced. The real problem was unanticipated – coal shortages in the winter of 1917-18 would force many people in town to turn to firewood. In the two years following the war, chimney fires spiked in town as the lingering creosote unexpectedly caught flame. Quickly, the town snapped into action. The Red Cross, only newly organized in town, began a sewing committee to make hospital garments and bandages. Knitters were recruited – never underestimate the power and need for knitters. “An urgent appeal for knitted articles for the United States Navy has been received. Will anyone willing to knit for our own sailors please communicate with Miss Grouard, 12 Lincoln Street.” Phillips Exeter Academy’s battalion marched down Front Street, reviewed by Principal Lewis Perry on May 25, 1917. “It was headed by a bicycle corps recently organized for patrol work,” reported the News-Letter. Exeter formed a home guard to “go wherever it may be needed” in the name of home defense. The early months of the war were thus occupied with organization and a shifting of the isolationist mindset that most Americans had harbored. The shift happened quickly. 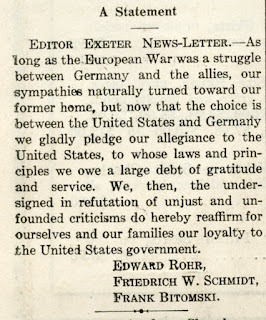 Within a day of the declaration, the Exeter News-Letter published this: “An Inspiring Sight: Loyalty to the country is plainly shown by the display of stars and stripes in the stitching room of Gale Brothers. Between 75 and 100 flags of all sizes are suspended from every conceivable place. The effect is indeed inspiring. Mrs. Norman McDougal, the forewoman, and nearly if not all of her employees, regardless of nationality, stand ready to uphold the principles which our flag represents. Mothers, wives, sweethearts and sisters with tear dimmed eyes and aching hearts will, if they must, bid the men and boys God speed at the sound of the bugle call.” The pain and heartbreak of war would arrive in the following months as the reality of war came home in caskets. 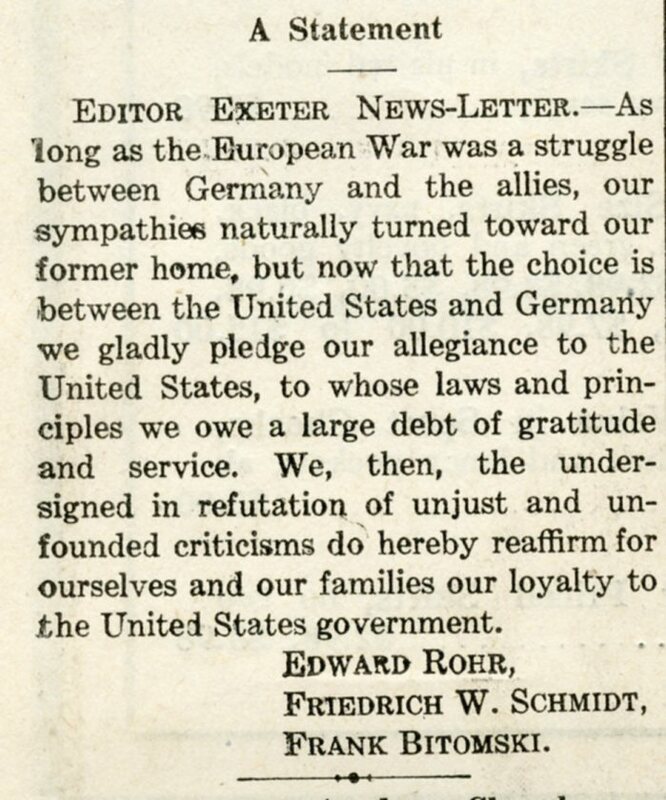 Image: After the United States entered World War I on April 6, 1917, several of Exeter’s German-born businessmen took out this advertisement in the Exeter News-Letter to reassure residents of their loyalty. Barbara Rimkunas is curator of the Exeter Historical Society. Her column appears every other Friday and she may be reached at info@exeterhistory.org. She’ll be following the 100th commemoration of World War I and Exeter’s response in the upcoming year.